Society of Pharmaceutical Sciences and Research 1, Panchkula - 134112, Haryana, India. Getwell Pharmaceuicals 3, Udyog Vihar, Gurgaon - 122016, Haryana, India. ABSTRACT: Nipah virus infection (NiV) is a viral infection caused by the Nipah virus. Nipah virus provides one of the most striking examples of an emerging virus and illustrates many of the pathways leading from a wildlife reservoir to human infections. Prior to 1998 there had been no reports of a disease of wildlife, domestic animals or humans that would subsequently be considered infection with Nipah virus. Despite the emergence of the related virus, Hendra, a number of years before Nipah virus, there was nothing to herald the sudden appearance of this virus, which in itself is surprising given the regularity of outbreaks since it appeared. However, the characterization of Hendra virus paved the way for the identification of the causative agent of disease in Malaysian pigs and farm workers and assisted in the recognition of the source of the infection and the pathway from the wildlife reservoir to humans. The symptoms start to appear within 3 - 14 days after exposure. The risk of exposure is high for hospital workers and caretakers of those infected with the virus. Prevention of Nipah virus infection is important since there is no effective treatment for the disease. Nipah virus outbreaks have been reported in Malaysia, Singapore, Bangladesh and India. 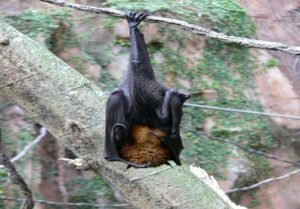 INTRODUCTION: Until the NIPAH outbreak in Malaysia in 1999, knowledge of human infections was limited to the small number of cases associated with the emergence of Hendra virus in Australia in 1994. 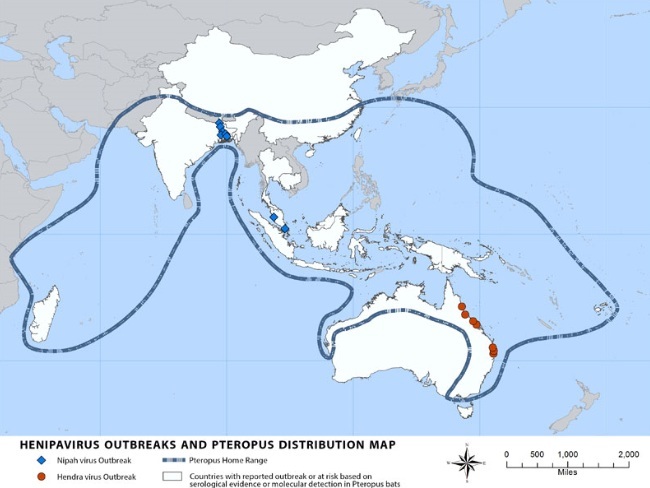 The NIPAH outbreak in Malaysia alerted the global public health community to the severe pathogenic potential and widespread distribution. This chapter briefly describes the initial discovery of Nipah virus and challenges encountered 1. NIPAH virus is a recently emergent paramyxovirus that is capable of causing severe disease in both humans as febrile encephalitis with respiratory syndrome and in animals like fruit bats and pigs. Its name originated from Sungai Nipah, a village in the Malaysian peninsula where pigs farmers became ill with encephalitis. Nipah virus infection (NiV) is a viral infection caused by the Nipah virus 2. Symptoms from infection vary from none to fever, cough, headache, shortness of breath, and confusion. This may worsen into a coma over a day or two Complications can include inflammation of the brain and seizures following recovery 2, 3. The Nipah virus is a type of RNA virus in the genus Henipavirus 3. It can both spread between people and from other animals to people 3. Spread typically requires direct contact with an infected source 4. The virus normally circulates among specific types of fruit bats 3. Diagnosis is based on symptoms and confirmed by laboratory testing 5. Management involves supportive care. As of 2018 there is no vaccine or specific treatment 3. Prevention is by avoiding exposure to bats and sick pigs and not drinking raw date palm sap 6. As of May 2018 about 700 human cases of Nipah virus are estimated to have occurred and 50 to 75 percent of those who were infected died 7, 8, 9. In May 2018, an outbreak of the disease resulted in at least 17 deaths in the Indian state of Kerala 10, 11, 12. The disease was first identified in 1998 during an outbreak in Malaysia while the virus was isolated in 1999. It is named after a village in Malaysia, Sungai Nipah 13. Pigs may also be infected and millions were killed in 1999 to stop the spread of disease 3, 13. Identification of NIPAH Virus: On 11th of March 1998, after 3 days of fixation and embedding in epon, the inactivated Vero cells infected with the virus were ready for viewing under electron microscope, but due to lack of proper working microscope in University. Dr. Chau took ultra thin sections of electron microscopy slides prepared by Ms Elsie Wong of Department of Pathology to the Institute of Higher Learning of the University, but to the disappointment the electron microscope was not maintained well due to which only few blurred images of envelope viral particles of size 100+ to 200+ nm with thickening of infected cell membrane were visible, finally no conclusive information obtained. On 14th of March, Dr. Chau met Dr. Nick of Centre of disease Control and Prevention (CDC), USA. Dr. Nick handed Dr. Chau, the whole panel of typing antibodies against known abroviruses of immunoflorosence assay technique, Dr. Chau used the antigen slides he brought along, 2 h later, Dr. Nick and Dr. Chau found that none of the antibodies in the typing panel reacted with the virus infected cell. Then Dr. Cropp handed Electron microscope to Dr. Chau, that microcope was old version which needs liquid nitrogen system for cooling. Dr. Chau turned on the screen and recognised “concrete ring like” structures of paramyxovirus nucleocapsids. Dr. Chau cutted the transverse section of viewed structure and again viewed in electron microscope. He faxed the images to the CDC, Malaysia with help of Dr. Cropp, the conclusion came that structures found were new type of paramyxoviruses, immediately teleconference between CDC, USA and CDC, Atlanta happened and decision was taken to transfer all the things carried by Dr. Chau to CDC, Atlanta for observation. After observing the slides of Dr. Chau, the CDC team of Atlanta confirmed that results obtained by Dr. Chau are positive. That was how NIPAH viruses identified 14. NIPAH Virus: Nipah virus is a zoonotic virus (it is transmitted from animal to humans). NIPAH virus is in the newly created Henipavirus genus with the closely related Hendra and Cedar virus. The Henipavirus family is pleomorphic, meaning their shape is varied and traditionally 40 to 600 nm in diameter. The core of a virion contains a linear ribonucleoprotein (RNP) comprising of negative sense single strand RNA. Also present in the RNP are three critically important proteins: Nucleo-capsid proteins (N) are tightly bound to the various nucleotides of the RNA strand and important for capsid structure, Phosphoproteins (P) and large polymerase proteins (L) are also bound to the RNA to m RNA to antigenomic RNA. The virion is enveloped by a traditional lipid bilayer but “spiked” with fusion and receptor binding glycoproteins 15. 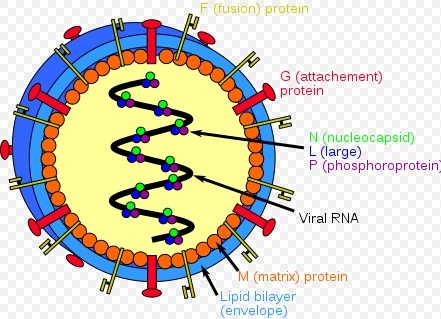 Viral proteins are F (fusion protein) and G (Attachment glycoprotein protein). Incubation Period, Signs and Symptoms: Infection with Nipah virus is associated with encephalitis (inflammation of brain). After exposure and an incubation period of 5 to 14 days, illness presents with 3 - 14 days of fever and headache, followed by drowsiness, disorientation and mental confusion. However, 45 days long incubation period has been reported. These signs and symptoms can progress to coma within 24 - 48 h. Some patients have a respiratory illness during early part of infection and half of the patients showing severe neurological signs showed also pulmonary signs. Long term squeals following Nipah virus infection have been noted, including persistent convulsions and personality changes. Latent infections with subsequent reactivation of Nipah virus and death have been also been reported months and even years after exposure 16. Encephalitis is a potentially fatal complication of Nipah virus infection. History and Origin of Nipah Virus: The history of NiV goes back to the year 1998, when the first outbreak of NiV occurred in peninsular Malaysia during the period between September 1998 and April 1999. A total of 265 cases of NiV encephalitis were reported from Malaysia, among those who had close contact with infected pigs or had physical contact with NiV infected patients. Importantly, the disease has devastating zoonotic potential, which is reflected by the fact that over 1 million pigs were culled and destroyed to control the disease in Malaysia, causing huge economic losses and adverse social disruption. In March 1999, 11 abattoir workers in Singapore became infected after handling imported pigs from Malaysia. It is interesting to note that NiV infections can cause high mortality, such as in the Malaysian outbreak, or low mortality as in the Singapore outbreak where the abattoir workers primarily presented with neurological compli-cations and pneumonia. Since May 1999, no new NiV outbreaks have been reported from Malaysia and Singapore till date. However, evidence of the virus, without clinical disease, has been found in fruit bats in Madagascar, Cambodia, Thailand, Timor-Leste, and Indonesia. Since there have been no reports of circulation of NiV prior to 1998, scientists have hypothesized that the virus remained largely within the fruit bat population in the tropical forests of Malaysia. However, due to mass deforestation activities to develop settlements, farming and rearing of domestic animals including pigs for food production, the natural habitat of the fruit bats was encroached by humans. Consequently, pigs became infected with NiV from the urine and faeces of these bats. The virus replicated rapidly within the pigs, as a result of which the virus became amplified and eventually spilled-over to the farmers rearing the pigs, who become infected by animal to human transmission. Eventually, more and more people became infected by human-to-human transmission and when it reached the “tipping-point”, the explosive Malaysian outbreak occurred. Hosts and their Life Cycles: Hosts are fruit bats and pigs. Fruit bats of Pteropodidae family and pigs are mainly act as intermediator of transmittance between bats and humans. Fruit Bats: members of Pteropodidae family are known as flying foxes or old world fruit bats. The family consist of 41 genera and about 170 species. Species are found as far as South Africa, the islands of the Indian Ocean, to the northern and western coasts of Australia along with across south Asia. Pteropodids have been known to live atleast 30 years both in captivity and in wild. Diagnosis: Laboratory diagnosis of Nipah virus infection is made using reverse transcriptase polymerase chain reaction (RT-PCR) from throat swabs, cerebrospinal fluid, urine and blood analysis during acute and convalescent stages of the disease. IgG and IgM antibody detection can be done after recovery to confirm Nipah virus infection. Immunohisto chemistry on tissues collected during autopsy also confirms the disease 12. Viral RNA can be isolated from the saliva of infected persons. ELISA: “ELISA” stands for “Enzyme-linked Immunosorbent Assay”. It is a very accurate and sensitive immunological test for detecting antigens or antibodies, depending upon the format of the ELISA technique used. In case for NiV infection, antibodies will be generated against the virus surface proteins (antigens). These antibodies circulate within the patient’s blood. So, a small sample of blood can be used for detecting as well as quantifying the level of virus-specific antibodies in the patient’s body using the ELISA test. The level of these antibodies is technically termed as “titer”, which gives an idea of the amount of virus present in the body - the higher the titer, the higher the severity of the disease. RT-PCR: “RT-PCR” stands for “Reverse Transcription-Polymerase Chain Reaction”. This is one of the most sensitive molecular tests currently available for detection of viral infections. Since NiV has an RNA genome, a minute sample of blood is taken from the patient, which will contain the viral RNA. The RNA is unstable, so it has to be converted to DNA, which is more stable. This is done by “reverse transcription” of the RNA to produce complementary DNA (cDNA), which is subsequently amplified by PCR using a thermocycler to generate millions of copies of the DNA from even a single strand of DNA molecule. This DNA is quantified by a procedure called ‘agarose-gel electrophoresis’. A positive test indicates that virus is definitely present in the patient’s body. In any outbreak situation, these tests are generally carried out at the National Institute of Virology, Pune, which is the National Reference Laboratory for viral diseases in India. Risks: The risk of exposure is high for hospital workers and caretakers of those infected with the virus. In Malaysia and Singapore, Nipah virus infection occurred in those with close contact to infected pigs. In Bangladesh and India, the disease has been linked to consumption of raw date palm sap (toddy) and contact with bats 18. Treatment: Currently there is no effective treatment for Nipah virus infection. The treatment is limited to supportive care. It is important to practice standard infection control practices and proper barrier nursing techniques to avoid the spread of the infection from person to person. All suspected cases of Nipah virus infection should be isolated. Ribavirin has been studied in a small number of people, however whether or not it is useful is unclear as of 2011 22. Passive immunization using a human monoclonal antibody that targets the Nipah G glycoprotein has been evaluated in the ferret model as post-exposure prophylaxis 7, 12. The anti-malarial drug chloroquine was shown to block the critical functions needed for maturation of Nipah virus, although no clinical benefit has yet been observed 23. m102.4, a human monoclonal antibody, has been used in people on a compassionate use basis in Australia and was in pre-clinical development in 2013 7. Prevention: Prevention of Nipah virus infection is important since there is no effective treatment for the disease. The infection can be prevented by avoiding exposure to bats in endemic areas and sick pigs. Drinking of raw palm sap (palm toddy) contaminated by bat excrete 19, eating of fruits partially consumed by bats and using water from wells infested by bats 20 should be avoided. Bats are known to drink toddy that is collected in open containers, and occasionally urinate in it, which makes it contaminated with the virus 19. Surveillance and awareness are important for preventing future outbreaks. The association of this disease within reproductive cycle of bats is not well studied. Standard infection control practices should be enforced to prevent nosocomial infections. A subunit vaccine using the Hendra G protein was found to produce cross-protective antibodies against henipavirus and nipavirus has been used in monkeys to protect against Hendra virus, although its potential for use in humans has not been studied 21. Transmission of Nipah Virus: Nipah virus is carried by fruit bats, which are the natural reservoir hosts. The virus is present in bat urine, feces, and saliva. It has been reported that fruit bats can infect date palm sap, while being extracted from palm trees. Upon consumption of raw sap, the infection can spread to humans. Likewise, fruits bitten by fruit bats can become infected, which upon consumption can cause NiV infection in humans. The intermediate hosts are usually pigs. Infected pigs can infect other pigs as well as domestic animals. This is an example of animal-to-animal transmission. Infected pigs can also transmit the disease to humans, especially to pig handlers or through consumption of pork. This is called animal-to-human transmission. In Malaysia, when authorities conducted an investigation, they found that the disease was contracted from pigs, pigs were infected with the virus after they consumed the fruits partially eaten by bats. Authorities noticed that migratory bats had spread the disease. The fruits ate by pigs had traces of saliva of bats. People who had touched the secretions from the nose and the other areas of pigs fell sick. The virus had spread from animal to humans, not human to human 33. Importantly, the disease can also be spread between humans by nasal discharges and other body fluids. The virus can also be transmitted via fomites such as clothing, equipment and shoes. This transmission between humans is called human-to-human transmission. Close contact with the excretions and secretions of individuals potentially infected with the virus. Consumption of partially-eaten fruits by bats. Undercooked meat of infected animals. Drinking of raw date palm sap/juice/toddy, which may be infected. Uncovered containers used for collecting raw date palm sap can potentially cause NiV infection if the contents become infected by fruit bats. What are the Consequences of Nipah Virus Infection? The consequences of NiV infection can be very grave. Serious complications such as encephalitis, associated with ‘brain fever’ can occur, where there is inflammation of the brain. When these complications occur, control of NiV replication is not possible. A consequence of this is altered consciousness, sometimes even causing the patient to become unconscious. In very severe cases, the patient can slip into coma within a matter of 24 to 48 h. The ultimate consequence of this is death! 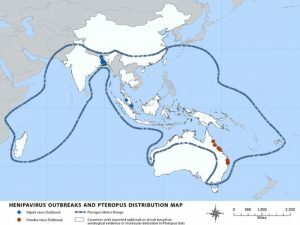 Malaysia Outbreak: It is the first outbreak of Nipah in the world (discussed above). The disease was primarily spread by infected pigs. Besides pigs there is evidence of NiV infection in several species of domestic animals, including dogs, cats, goats, horses, and possibly also sheep. However, following the initial Nipah outbreaks, the virus has primarily affected human populations around the globe 22-28. Bangladesh Outbreak: NiV was isolated during an outbreak in April-May 2001 in Meherpur district of Bangladesh. In this Bangladesh outbreak, there were 13 cases and 9 deaths, with a case fatality rate of 69%. Since then, NiV encephalitis has been reported almost every year in many districts in Bangladesh 29. In the Bangladesh and Indian outbreaks, there was no involvement of pigs in the transmission of NiV infection, unlike the Malaysian outbreak. Consumption of raw date palm sap infected by fruit bats was the primary cause of the spread of NiV 30. India Outbreak: This is the second Indian outbreak, which occurred in Nadia district of West Bengal. In this outbreak 30 patients initially presented with febrile illness, of which 5 were confirmed as Nipah cases. All 5 cases proved to be fatal. All the fatal cases tested positive for NiV by RT-PCR. Therefore, the case fatality rate in this outbreak was 100%. The third outbreak to occur in India and is currently ongoing in Kozhikode district in Kerala. Of the 20 patients who had presented with symptoms of NiV infection, 12 have so far died, including a nurse who got infected while treating patients. In the outbreaks reported in Bangladesh and India, so far 263 NiV encephalitis cases and 196 deaths have been reported since 2001. NiV encephalitis exhibits a case fatality rate of 0-100%, with an average case fatality rate of 74.5% 31, 32. CONCLUSION: Nipah virus is a rising unknown disease for India with no treatment and works only on prevention that’s are set to be host for the disease but how bats are infected is unknown till now. First case was recorded in 1999 Kampung Sungai Nipah in Malaysia and the name of the disease originated from it. ACKNOWLEDGEMENT: The author thankful with our deepest core of heart to Dr. Shashi Alok and Monika Sabharwal, for his valuable guidance. Chau KB: Introduction: Nipah Virus- discovery and origin; Curr. Top. Microbio. Immunol. 2012; 359: 1-9. Signs and Symptoms Nipah Virus (NiV). CDC. Retrieved 24 May 2018.
WHO Nipah Virus (NiV) Infection. www.who.int. Archived from the original on 18 April 2018. Retrieved 21 May 2018. Broder, Christopher C.; Xu, Kai; Nikolov, Dimitar B.; Zhu, Zhongyu; Dimitrov, Dimiter S.; Middleton, Deborah; Pallister, Jackie; Geisbert, Thomas W.; Bossart, Katharine N.; Wang, Lin-Fa (October 2013). "A treatment for and vaccine against the deadly Hendra and Nipah viruses". 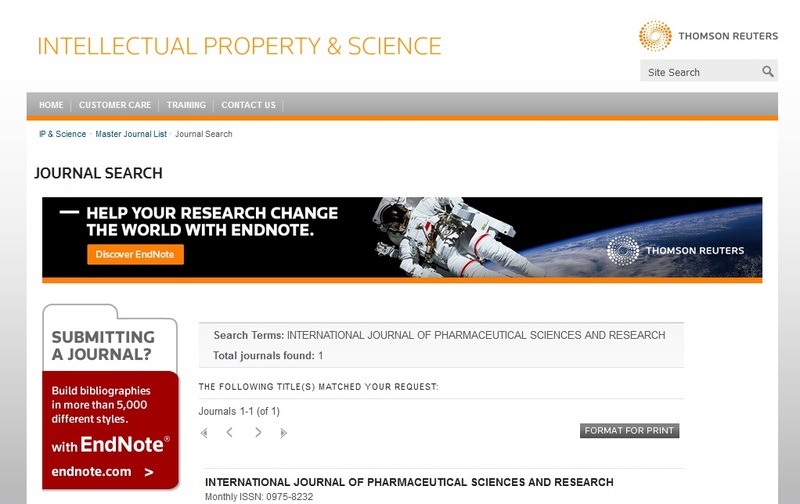 Antiviral Research 2013; 100(1): 8-13. doi:10.1016/j.antiviral.2013.06.012. Nipah virus outbreaks in the WHO South-East Asia Region. South-East Asia Regional Office. WHO. Retrieved 23 May 2018. CNN, Manveena Suri, (22 May 2018). "10 confirmed dead from Nipah virus outbreak in India". CNN. Retrieved 25 May 2018. Nipah virus outbreak: Death toll rises to 14 in Kerala, two more cases identified. Hindustan Times. 27 May 2018. Retrieved 28 May 2018. Nipah Virus (NiV) CDC. www.cdc.gov. CDC. Archived from the original on 16 December 2017. Retrieved 21 May 2018. Luby, Stephen P, Jahangir HM, Gurley, Emily S, Ahmed, Be-Nazir, Banu, Khan S, Uddin S, Homaira, Nusrat, Rota, Paul A, Rollin, Pierre E, Comer, James A, Kenah, Eben, Ksiazek, Thomas G and Mahmudur R: Recurrent Zoonotic Transmission of Nipah Virus into Humans, Bangladesh, 2001-2007. Emerging Infectious Diseases. 2009; 15(8): 1229-1235. Chau KB: The discovery of Nipah virus: A personal account; Neurology Asia 2004; 59-63. Luby, Stephen P; Gurley, Emily S, Hossain and Jahangir M: Transmission of human infection with nipah virus. National Academies Press (US). Archived from the original on 22 May 2018. Retrieved 21 May 2018. Saiful IM et al. : Nipah Virus Transmission from Bats to Humans Associated with Drinking Traditional Liquor Made from Date Palm Sap, Bangladesh, 2011–2014. Emerging Infectious Diseases 2016; 22(4): 664-670. doi:10.3201/eid2204.151747. ISSN 1080-6040. Archived from the original on 11 December 2017. Balan, Sarita (21 May 2018). "6 Nipah virus deaths in Kerala: Bat-infested house well of first victims sealed". The News Minute. Archived from the original on 22 May 2018. Retrieved 21 May 2018. Bossart et al. : A Hendra Virus G Glycoprotein Subunit Vaccine Protects African Green Monkeys from Nipah Virus Challenge". Science translational medicine 2012; 4(146): 146ra107. doi:10.1126/scitranslmed.3004241. ISSN 1946-6234. PMC 3516289 Freely accessible. Archived from the original on 22 May 2018. Vigant F and Lee B: Hendra and nipah infection: pathology, models and potential therapies". Infectious disorders drug targets 2011; 11(3): 315-36. PMID 21488828. Broder et al. : A treatment for and vaccine against the deadly Hendra and Nipah viruses. Antiviral Research 2013; 100(1): 8-13. doi:10.1016/j.antiviral.2013.06.012. ISSN 0166-3542. Retrieved 21 May 2018. Chadha MS, Comer JA, Lowe L, Rota PA, Rollin PE, Bellini WJ, Ksiazek TG, Mishra A, Comer, Lowe, Rota, Rollin, Bellini, Ksiazek and Mishra: Nipah virus-associated encephalitis outbreak, Siliguri, India". Emerging Infectious Diseases 2006; 12(2): 235–40. doi:10.3201/eid1202.051247. PMC 3373078 Freely accessible. PMID 16494748. Eaton BT, Broder CC, Middleton D and Wang LF: Hendra and Nipah viruses: different and dangerous. Nature Reviews. Microbiology 2006; 4(1): 23-35. Chadha MS, Comer JA and Lowe L: Nipah virus-associated encephalitis outbreak, Siliguri, India". Emerging Infectious Diseases 2006; 12(2): 235-40. Hsu VP, Hossain MJ and Parashar UD: Nipah virus encephalitis reemergence, Bangladesh. 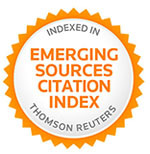 Emerging Infectious Diseases 2004; 10(12): 2082-7. doi:10.3201/eid1012.040701. Arguments in Bahodderhat murder case begin. The Daily Star. 18 March 2008. Archived from the original on 24 October 2012. Retrieved 21 May 2014. Bever, Lindsey (2018-05-22). Rare, brain-damaging virus spreads panic in India as death toll rises. Washington Post. ISSN 0190-8286. Retrieved 2018-05-31. Lini Puthussery: India's 'hero' nurse who died battling Nipah virus. BBC News. Retrieved 22 May 2018. Bossart KN, Zhu Z, Middleton D, Klippel J, Crameri G, Bingham J, McEachern JA, Green D, Hancock TJ, Chan YP, Hickey AC, Dimitrov DS, Wang LF and Broder CC: A Neutralizing Human Monoclonal Antibody Protects against Lethal Disease in a New Ferret Model of Acute Nipah Virus Infection. PLoS Pathogens2009; 5(10): e1000642. Hermesauto: Rare brain-damaging Nipah virus kills 10 in India, prompts rush to hospitals. The Straits Times. Retrieved 2018-05-23. Chanchal DK, Alok S, Sabharwal M, Bijauliya RK and Rashi S: Nipah: silently rising infection. Int J Pharm Sci Res 2018; 9(8): 3128-35. doi: 10.13040/IJPSR.0975-8232.9(8).3128-35.